Dimensions 0.25 by 6 by 8.75 in. Amazon.com description: Product Description: Reprint 1915 eidtion. Paperback. Translated by Ian Johnston The Original German edition Die Verwandlung published by K. Wolff, Leipzig, 1915.The Metamorphosis (German: Die Verwandlung) is a novella by Franz Kafka, first published in 1915. It is often cited as one of the seminal works of short fiction of the 20th century and is widely studied in colleges and universities across the western world. 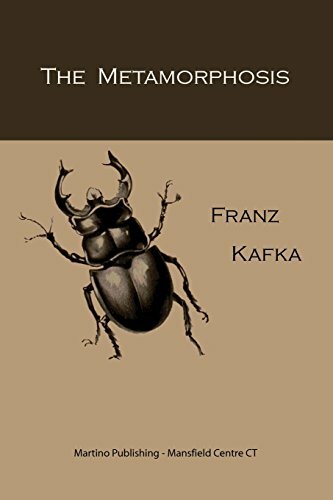 The story begins with a traveling salesman, Gregor Samsa, waking to find himself transformed into an insect.Critics have interpreted Kafka's works in the context of a variety of literary schools, such as modernism, magical realism, and so on. The apparent hopelessness and absurdity that seem to permeate his works are considered emblematic of existentialism. Others have tried to locate a Marxist influence in his satirization of bureaucracy in pieces such as In the Penal Colony, The Trial, and The Castle, whereas others point to anarchism as an inspiration for Kafka's anti-bureaucratic viewpoint. Still others have interpreted his works through the lens of Judaism, through Freudianism, or as allegories of a metaphysical quest for God. Themes of alienation and persecution are repeatedly emphasized. Biographers have said that it was common for Kafka to read chapters of the books he was working on to his closest friends, and that those readings usually concentrated on the humorous side of his prose. Milan Kundera refers to the essentially surrealist humour of Kafka as a main predecessor of later artists such as Federico Fellini, Gabriel GarcÃ­a MÃ¡rquez, Carlos Fuentes and Salman Rushdie. For GarcÃ­a MÃ¡rquez, it was as he said the reading of Kafka's The Metamorphosis that showed him "that it was possible to write in a different way."